>Chez Carey! Super easy/fast/inexpensive/healthy salmon cakes. It’s another snow day out there. With about 5 inches on the ground already, I won’t be attempting to run today. On non-run-able days I make a little extra effort to eat healthy foods so as not to mess with the lack of calories burned. I’ve also been on a cooking kick lately, trying to save money and really just enjoying how creative of an art it is. I made today’s lunch rummaging through my pantry and fridge to use what I had on hand. This whole meal probably cost about $2.50. NICE and delicious! This recipe is a concept, like all of the ones I post, and can be used as a loose guideline. Feel free to change the veggies and sauces involved and add or subtract flavors that you like/dislike. I’m sure this would also be great with garlic, scallions and herbs added in. Mix in 2 small cans of salmon, use the juice from one can but drain the other. Dice some celery and radish and throw that in the bowl too. Add some Worcestershire sauce, lemon juice, Tabasco and mix it all up. Form 4 cakes and squeeze most of the moisture out of them. Roll the cakes in panko breadcrumbs until well coated. Put a couple of tablespoons of olive oil in a pan, warm over high heat, add cakes and turn down heat to medium. Don’t move them around much. Brown on each side for 2-3 minutes. 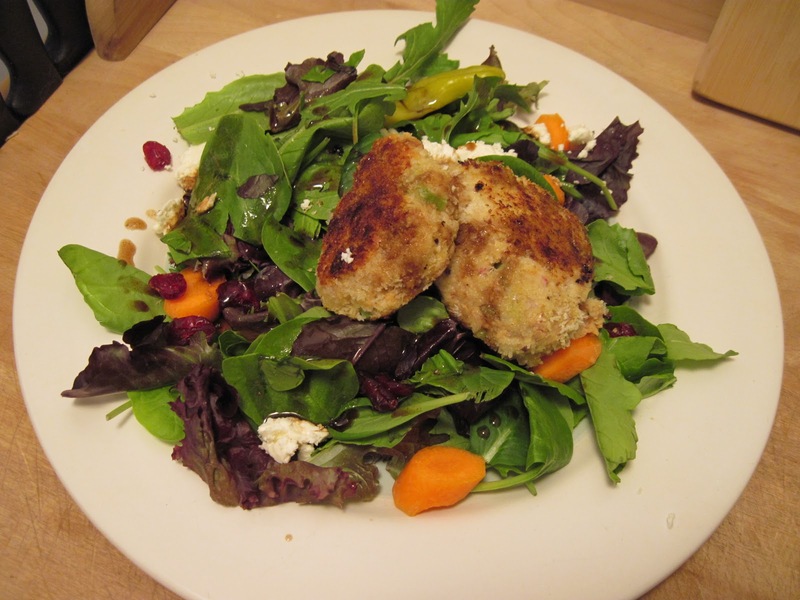 Top with 2 salmon cakes and make a quick olive oil/balsamic dressing to pour over the top! I plan to use the 2 other cakes for a little dinner appetizer tomorrow with homemade spicy tartar sauce.